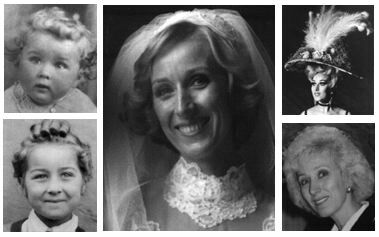 Five pictures of Rosemary, at her wedding (centre), as a baby, at school (right), as a Bluebelle Girl, more recently (right). All Rosemary's dresses were made by Nancy Tall, who taught herself to make clothes, cover furniture, repair prams etc etc. These photos taken at 38 Berrymoor Rd where we lived from around 1950 to around 1958. 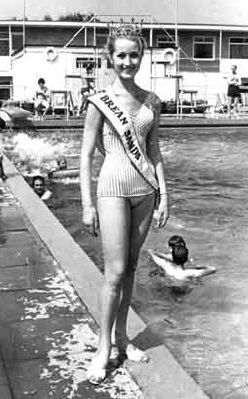 Rosemary had a short (amateur) career as a beauty queen before going professionally into dancing. 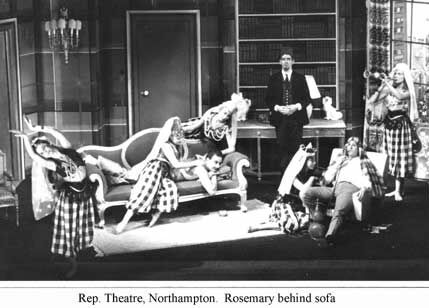 Rosemary had a number of small parts on the stage as a teenager, including this role at the Northampton Repertory Company. 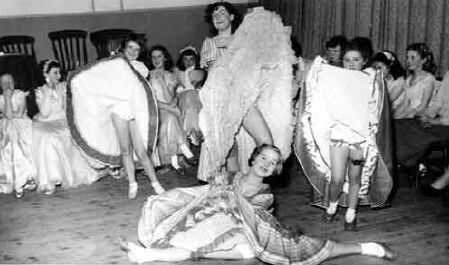 Rosemary (centre) as a Bluebelle girl in Las Vegas. Rosemary as a Bluebelle at the Lido in Paris, her first job as a professional dancer. Rosey's five minutes of fame on TV with Derek Nimmo visiting Las Vegas. Rosemary in England to renew her marriage vows.